SOURCE: AT & T Inc.
SYDNEY, AUSTRALIA--(Marketwired - Jan 14, 2014) - Malcolm Coutts OAM, Chief Executive Officer of Ronald McDonald House Charities Australia, receives a check for US$20,000 from Martin Creighan, AT&T* Managing Director for Australia and New Zealand. The donation is part of AT&T's ongoing support and commitment to the communities in which it operates around the region. "Ronald McDonald House Charities strives to improve the health and well being of seriously ill children. We carry out programs in Australia that help these children and their families while they receive medical treatment, and assist recovering children to return to normal life," said Malcolm Coutts OAM, Chief Executive Officer of Ronald McDonald House Charities Australia. "Thanks to the support of AT&T, we will continue to help those children and families who need it most in Australia." "AT&T has had a long standing relationship with McDonald's globally. Through this relationship we have supported Ronald McDonald House Charities in the US and are proud to extend it to Australia," said Martin Creighan, AT&T Managing Director for Australia and New Zealand. AT&T Inc. (NYSE: T) is a premier communications holding company and one of the most honored companies in the world. Its subsidiaries and affiliates -- AT&T operating companies -- are the providers of AT&T services in the United States and internationally. With a powerful array of network resources that includes the nation's fastest and most reliable 4G LTE network, AT&T is a leading provider of wireless, Wi-Fi, high speed Internet, voice and cloud-based services. A leader in mobile Internet, AT&T also offers the best wireless coverage worldwide of any U.S. carrier, offering the most wireless phones that work in the most countries. It also offers advanced TV service with the AT&T U-verse® brand. The company's suite of IP-based business communications services is one of the most advanced in the world. 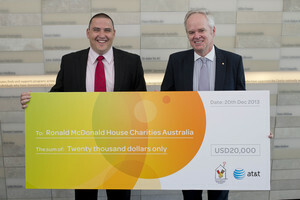 About this company AT & T Inc.
Malcolm Coutts OAM, Chief Executive Officer of Ronald McDonald House Charities Australia (right), at the McDonald's Australia Head Office, receives a check for $20,000 from Martin Creighan, AT&T Managing Director for Australia and New Zealand (left). Ronald McDonald House Charities strives to improve the health and well-being of seriously ill children. The donation is part of AT&T's ongoing support and commitment to the communities in which it operates in Asia Pacific.